The Man of Bronze in his own series at last! 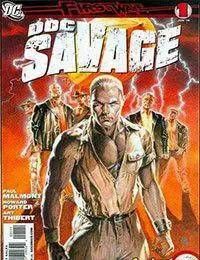 Doc Savage is the target of a brazen attack on New York City! Tragedy will strike one of Docs compatriots, and someone may not survive the opening pages of The Lord of Lightning! Written by Paul Malmont, national best-selling author of The Chinatown Death-Cloud Peril, with art by Howard Porter (JLA)! And dont miss the hard-hitting JUSTICE, INC. co-feature, starring Richard Benson, the Avenger! When criminals abduct one of his own detectives, Bensons icy heart sears with a rage hotter than any hes ever known. Worst Nightmare begins here, written by crime novelist Jason Starr (THE CHILL) with art by Scott Hampton (LUCIFER)!